Your assistance is needed to help the funny animals escape their farm via the tornado. Royal Panda has added the Tornado Farm Escape video slot to its extensive array of online casino games. Enjoy some funky country music of the American Southwest whilst spinning the reels of this farm-based slot from the Net Entertainment stable. 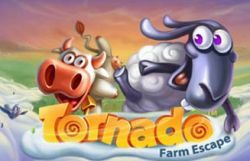 The Tornado Farm Escape online slot features two bonus modes, which both add a rewarding twist to this entertaining game. The Tornado feature starts if you land both a hot symbol on the first reel and a cold symbol on the fifth reel. This bonus mode triggers the symbol that emerges on the second row of the third reel. Subsequently, the tornado starts picking up all active wilds, and those symbols added together provide you with cash prizes. The second bonus mode, the storm feature, can become active on any given time. The storm moves one position in a random direction, starting from one of the outermost positions on the reels. During this process, the storm collects wilds, and this continuous until the storms blows over the reels and fades away. Almost needless to say that both bonus modes increase your chances of winning some cash while playing the Tornado Farm Escape slot. So what are you waiting for, visit Royal Panda and start helping the adorable farm animals.